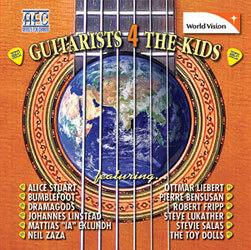 Created in 2006, Artists for Charity - Guitarists 4 the Kids CD project was conceptualized, arranged and produced by S. Lang (Slang Productions), to assist World Vision Canada in helping underprivileged kids in need. Creativity allows us to express our emotions, our celebrations, our very selves. Yet creativity is also applied in the field of international development, as people come together to create solutions that will improve the living conditions for those living in poverty. We want to thank everyone who shared their creative gifts to make this project happen. Tommy is the founding member and lead guitarist for San Francisco Bay area rock group "Tommy and the Stompers". Joy is a solo artist, touring and session musician who has worked with Jennifer Lopez, Jessica Simpson and CoCo Lee, among others. 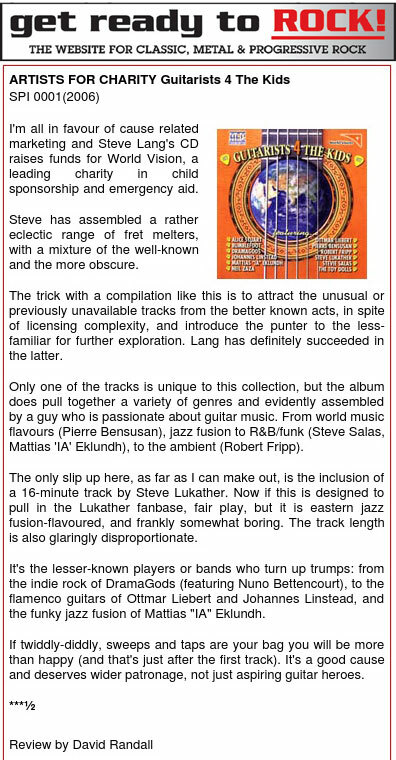 Dave is the founding member of instrumental fusion rock group "Martone" and has worked with artist Joe Satriani, among others. Dan is a pop, jazz and blues guitarist, session musician and founding member of "The Mung Brothers" in the New Jersey area. Michael is an experimental guitarist and solo artist specializing in fretless guitar, and founder of the New York Fretless Guitar Festival. Mattias is an experimental rock guitar solo artist and founding member of Swedish heavy metal group "Freak Kitchen". Terry is a solo rock guitarist in the San Francisco Bay area, and member of rock group "Hot For Teacher". Ron is the founding member of diverse New York City rock group "Bumblefoot" and also a member of "Guns n' Roses". Hand picked by George Clinton as the guitarist for Clinton's albums, and writing, producing, recording and performing on over 75 major releases around the world including artists Mick Jagger, Rod Stewart, Bootsy Collins, Was (Not Was), Terrance Trent D'arby, Micheal Hutchance (INXS), Jeff Healy, Sammy Hagar, among many others, Stevie has had a long career as a solo artist with his band Colorcode. Hailing from Los Angeles, DramaGods offer a powerful blend of authentic, pure rock and modern pop sensibilities. DramaGods are: Nuno Bettencourt, Steve Ferlazzo, Kevin "Figg" Figueiredo, and Joe Pessia. The Grand Daddy of Punk rock music, Michael "Olga" Algar leads his band The Toy Dolls into new grounds of punk music with his intricate and energetic guitar work and unique song arrangements. Invented the Nouveau Flamenco genre with the album of the same name in 1990. Dislikes genres, loves music. 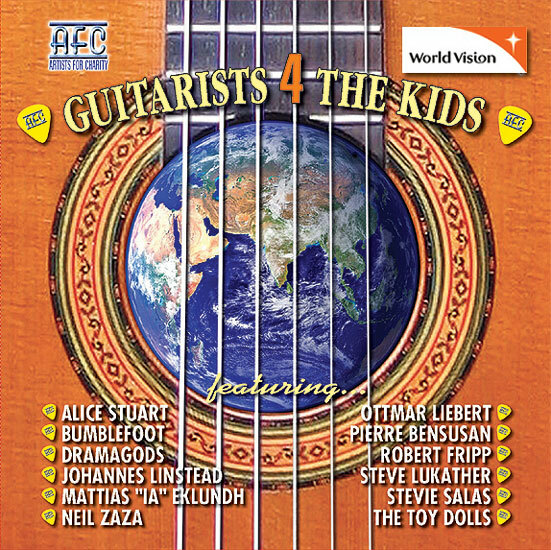 From winning two "Best World Album" awards, to having three top-ten charting albums, to top radio airplay, Johannes Linstead has become recognized internationally as one of best selling guitarists in the nouveau flamenco genre. Alice Stuart is back after putting her career on the shelf for many years to raise her children. Since her return, she has won numerous awards from the Seattle Weekly (Best Blues Band in 2004 and 2006 and Best Guitarist for 2005) as well as being awarded Best Songwriter by the Washington Blues Society 2003 through 2006 and Best New/Reformed Band in 2006. Having performed on over 1,500 records in his session career, touring the world over with Toto and other international artists, writing and producing commercial hits, Luke's song is from a rare bootleg with his side band "El Grupo" which displays his jazz fusion style in a live atmosphere. Ron Thal (a.k.a. Bumblefoot) is a recording artist and international touring artist from NYC with several albums released since 1995. Fronting the band as lead singer/guitarist, the music is hard rock, bordering on quirky and experimental. Ron is also a member of Guns n' Roses. An experiemntal rock guitarist hailing from Sweden, Mattias Eklundh leads his band Freak Kitchen into new grounds with an articulate and adventurous guitar style, blended with harddriving and often humourous rock grooves. Mattias offers everyone, in this solo effort, a special unreleased song: "Zoo Me"
Neil Zaza is a World-renowned instrumental guitarist with a record company and studio in Cleveland, Ohio. Along with performing to capacity crowds in Asia and Europe, Zaza holds an annual instrumental melodic-rock Christmas show in Cleveland which features a full symphony orchestra. 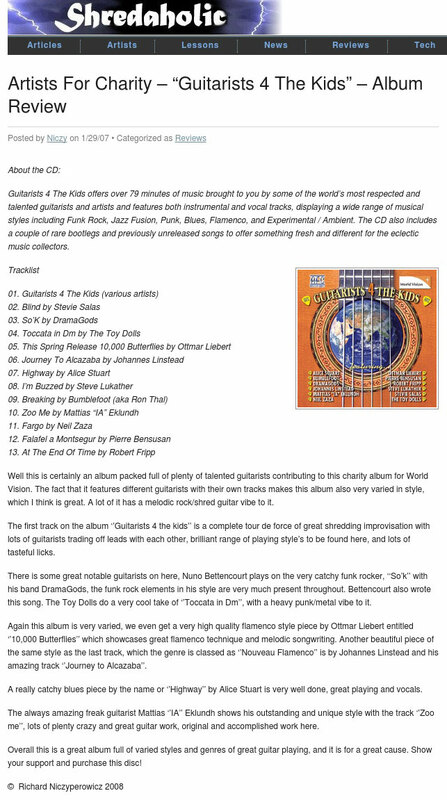 His latest album, When Gravity Fails, features Jordan Rudess (Dream Theater), Peter Frampton, among many others. While his name is synonymous with the guitar, Pierre Bensusan is the Cirque du Soleil of the Soul. This award winning guitarist is also a composer, warm & engaging performer and improvisational vocalist. Guitarist Robert Fripp has continually pushed the boundaries of pop music, as well as pursuing many avant-garde and experimental musical ideas. Fripp began playing professionally with the League of Gentlemen in the mid-'60s, which soon evolved into King Crimson, one of the most respected progressive rock bands of its era. On this record Robert presents one of his latest Frippertronics entitled, "At The End Of Time". Special thanks to Stevie Salas, Mike Bowman, Favored Nations, Charley Londono, Michael Oliverio (Sanctuary Records Group), Evelyn Cream, and all of the amazing guitarists involved in contributing to this project.